well with Christmas over and it being pretty warm here I am getting back into the swing of work and have started the year with these baselards. Many thanks to Chad for flagging these knives up late last year and also to a client of mine for comissioning one and that all raised my interest as well. When I have not really made a knife before I often like to make 2 or 3 so that by the end of the process I have really worked out how to make them and means that next time I am more likely to take the right approach so that is what I did here. My client wanted a brown scabbard and a copy of a particular knife that had these concave edges and flared shoulders and many of the pictures I was sent as reference had this very distinct feature. Many also had this 'caged' scabbard construction which is also rather tricky. All the examples I can think of had the very simple form of crimped chape, which I love (but is not so loved by the market). A cone of metal is formed, the bottom end is dagged and then it is soldered and shaped. The dagged end is then tapped closed to round it off. This form of chape was very common in the 12th-15thC particularly; it was cheap and workaday, but effective. I have used that type here. 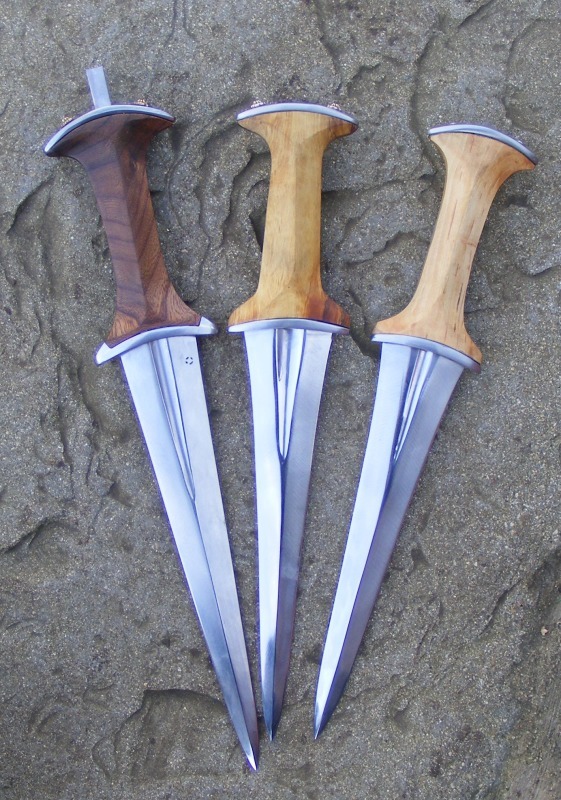 The top and bottom guards are pinned in place which is usual for daggers like this and bollock daggers also and so there are hidden pins under the blade that hold the bottom guard in place and the top ones can be plain or decorative - so I went both ways on these examples. The blades are also distinctive in another regard, in that at first glance they look like a diamond blade onto which a fuller has been applied. In fact the edge bevel stays quite constant and so as the blade gets wider a flat area develops i.e. the blade becomes hexagonal. On to this surface a fuller is applied and may be the full width of the flat or more commonly narrower than the flat, so a small flat area is left between the edge bevel and the fuller. The blades are quite short at 8 to 8.5" /20-22cm so they are really quite stiff yet light and with the handle form really enclosing the fist they feel authoratative. I also went for a more 'normal' blade, that is quite short and broad, which is another German favourite. 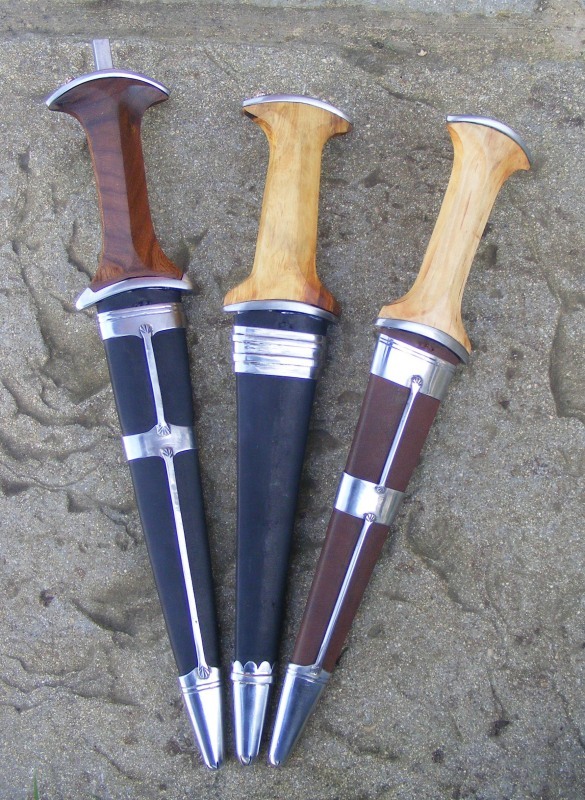 From left to right the handle woods are elm, box and blackthorn. The last thing to note is that the elm handled one is not yet assembled so it still has the tang protruding. I hope you like them and let me know if you have any questions. Wow nice as always. So are your chapes solidly round, folded, or soldered on the back side? 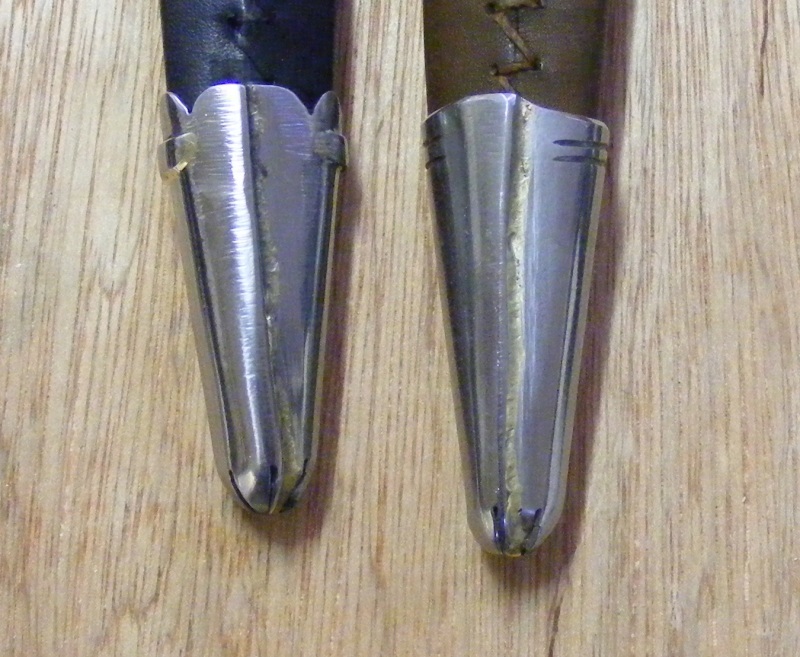 especially like the round point on the chapes. Glad I could help. These look great. I like that a number of examples of this form have odd blades, in terms of silhouette and section. They're also pretty short. I think it's a fascinating and under-done sector of daggers. This really makes me want to make more baselards as well! They are overlapped and soldered on the rear. Thanks Tod; my friend Ed has one of your blades (should have known) and he answered me this weekend. Thanks for showing the rear in a picture. 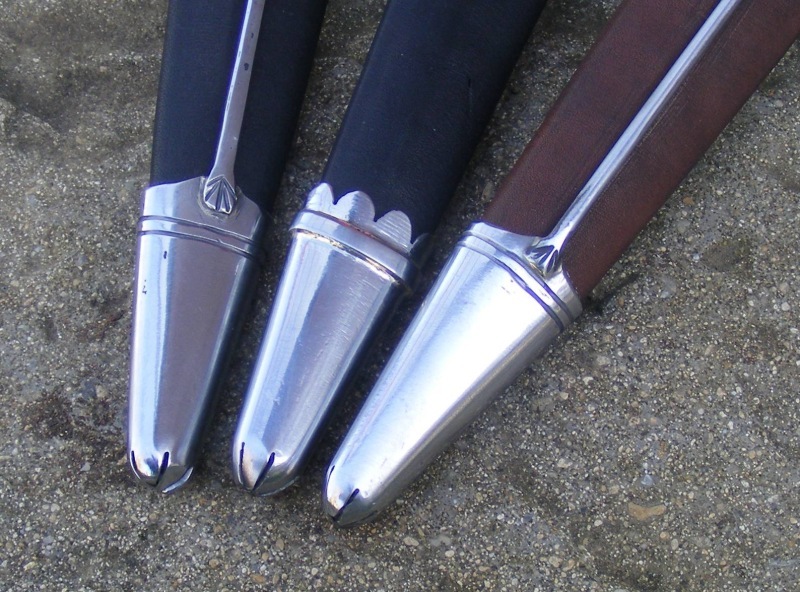 How would sheaths like these have been carried/fastened to the belt? I should have shown a whole 'behind the scenes' shot. The locket has a small loop soldered centrally on the back and passing freely through the loop is a ring. Great to see such a dagger type getting some attention. They all look spot on Tod. Great to get clues of how you make your shapes, because that's exactly how I've rounded the tip of mine so far (I improvised but in the end cut lines and curve them with pliers). I really like the proportions and blade profile of these...eye candy really. 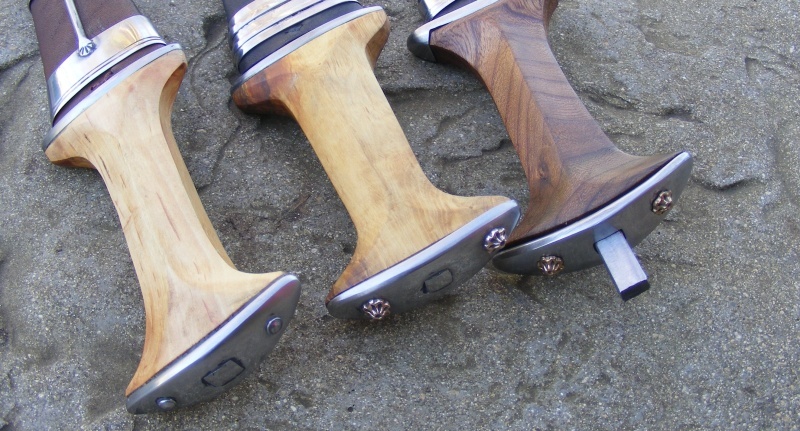 Just chiming in to say that these are very appealing knives and I really like the wood choices and aesthetics of the handles. If you want to look at a lot of originals of dagger and sword scabbard chapes (all from England) I can highly recommend the "The Portable Antiquities Scheme" site. In a lot of cases you can see very well how they are made. This is a great site; I stumbled on it recently while looking at Anglo Saxon scabbards and parts. (I happened I stumbled on this image just minutes before reading this reply). Theoderich von Lichtenhayn, Erfurt priory church, Germany.